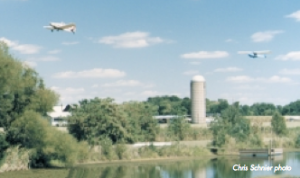 The Caesar Creek Soaring Club is one of America’s finest gliderports. The purpose of the club is to encourage the sport and art of soaring. We are a group of soaring enthusiasts from Cincinnati, Dayton, Columbus and surrounding areas. Originally founded in 1951 and averaging about 180 members, our gliderport is situated on 146 acres in beautiful Warren County near Waynesville, Ohio. The club owns 3 towplanes and 8 gliders which are available for members’ use. Approximately 35 privately owned sailplanes are also based at our gliderport. One of the special qualities of our club is the quiet rural atmosphere. We are lucky that we don’t have to share our flying with power planes because we own the gliderport! The club has many cookouts and other social events during the year. We often have “after-flying” get togethers on the covered porch of our newly expanded clubhouse. Camp sites and fishing are also available to members. Experience the excitement of soaring! Come out to the gliderport, observe our flight operations and take an inexpensive introductory ride to share in the thrill of pure flight (click here to find out more). Pick up a membership application at the gliderport or call 513-932-7627 to have one mailed to you and get your questions answered. To fly as the hawk and the eagle fly has been our dream for centuries. Today’s modern sailplanes make it possible to fly with the greatest of the soaring birds. 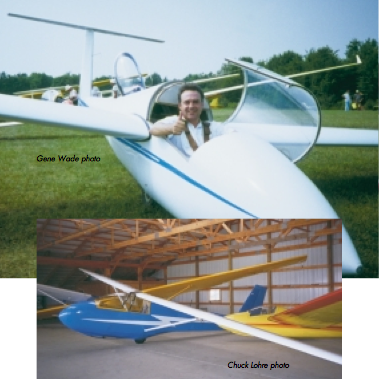 A visit to the Caesar Creek Soaring Club will let you glimpse the magic of pure flight that attracts people of all ages. Sailplanes take advantage of rising air currents to gain altitude (soar) and to fly for miles. Soaring offers an unsurpassed sense of freedom and exhilaration which is unique in sports. The sailplane is pulled aloft by a towplane. Usually a tow to 3000 feet above the ground will produce a flight of 15-20 minutes when no rising air currents are found. When you find rising air currents the real thrill of climbing without an engine begins! These rising columns of air, known as thermals, are common in Ohio from early Spring to late Fall. Glider pilots often share these thermals with hawks and other soaring birds. After a successful climb in a thermal, the pilot soars off across the beautiful country- side of Southwestern Ohio. Situated between the forested Little Miami River Valley and Caesar Creek Lake, our gliderport is a wonderful site to begin a soaring flight. In winter, thermals are less common but we still fly every weekend and Wednesdays as the weather permits. How can I learn to soar? Almost anyone in good health and sixteen or older can obtain a license. Students are permitted to fly solo at fourteen. 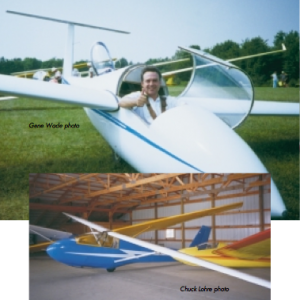 We have had students as young as twelve and some members are active pilots in their eighties.At Caesar Creek Soaring Club we take great pride in our training program. As a new member you will be entitled to all the lessons you need to learn to fly. Instruction is free. Although no two students are alike, it usually takes between 40 and 60 flights to fly solo for the first time. 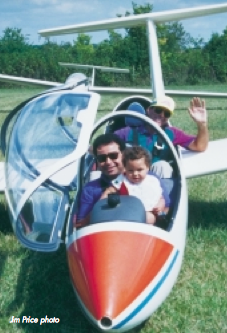 A Private Glider license usually takes 100 or more flights. 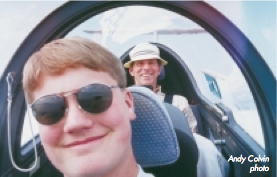 New members with previous experience in powered aircraft can make the transition quickly. In our club environment you get to know other students and share experiences while you progress. We have a reputation, among other glider clubs in the USA, of being one of the lowest cost and best training clubs. Approximately 20 instructors are available to help you! At any point in time, we have at least 10-15 students at some phase of instruction so you will be assured of having company. The club operates by volunteer membership participation. Members and students serve one day per month as a crew member. That way every weekend and Wednesday members consisting of ground handling crew, tow-pilots and instructors all directed by a Crew Chief are available. With all these people working for free, member costs are kept down. Also, because costs of ownership and maintenance are shared by the group, flight costs can be well below those of individually owned sailplanes. Your first step in learning to soar is taking an introductory sailplane flight. Download a PDF of the CCSC Brochure.